Thirty people comfortably filled the storefront community art center known as Mess Hall in Chicago’s Rogers Park neighborhood in spring 2005 for a brunch. They brought their ideas and experiences to contribute to a collective map making effort where they were asked to mark on a large blank map of Chicago 5 varieties of information: Historical Sites of Struggle; Historical Sites of Autonomy; Current Sites of Struggle; Current Sites of Autonomy; and Places where AREA should be distributed. This thing, AREA, was an unknown quantity – it was an initiative that had not yet been produced…a mere idea. This brunch was organized by AREA Chicago’s initiators in order to generate interest in its forthcoming newspaper/journal about Art/Research/Education/Activism in Chicago and collect ideas for meaningful current/historical content that could be contributed. It also seemed appropriate if ideas for content were being generated through map-making that suggestions of where to drop the publication off when it was finished and printed would be a good idea. So this is how AREA began and became public – putting the public in publication for the first time. Six years and 11 issues later it gets lost in hundreds of public events, meetings and publication release parties. But this is how it began: collectively compiling knowledge onto a map of the city we live, work and play in; expressing our sense of this place and sites of significance in a messy subjective manner for others to see, learn from, judge and discuss. The first issue of AREA Chicago was released a few months later over a Labor Day picnic along the Chicago River at Ping Tom Park in the Chinatown neighborhood. 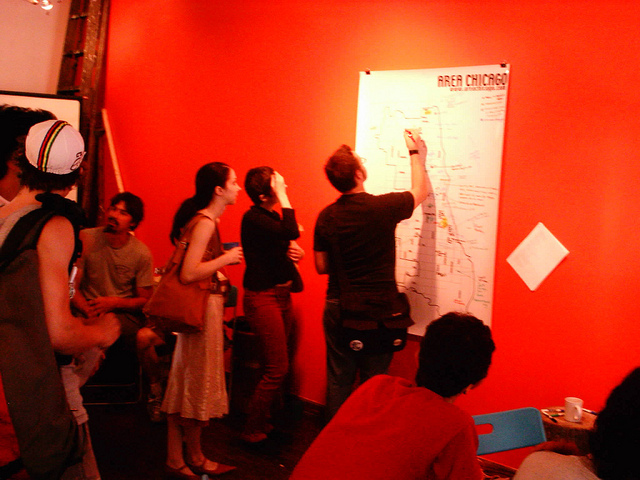 The publication included writings and projects by many of the people who had first gathered to map the city over brunch and the final product was physically delivered to many of the community and cultural centers the brunch-mappers had indicated were important places for this new effort to be distribute to. The first issue of AREA was focused on the way that Chicagoans were responding to the privatization of the public sphere. It included notes on young artists reclaiming youth-centered advertising in their neighborhoods; public school teachers fighting against charter schools; and graphic designers creating public relations campaigns to explain who has profited from the destruction of public housing (to name a few). The publication was just in its infancy and so it was decided by the editor and designer that the table of contents would be illustrated with a blank map of Chicago as a way to clearly illustrate that the contents all related to specific sites of “struggle/autonomy” in real places in the city and also as a way to indicate, through blank spots on the map, the extent to which the project was attempting to be city-wide in its scope but also had many gaps in its contributors and reference points. This use of the map seemed to intrigue many people and reinforced the concept as well as the aesthetic of the blank map of Chicago as a tool with which AREA would continue to work. From there, the second edition of the publication focused on the way that artists, researchers, educators and activists were responding to the local food system. This issue came with a centerfold blank map asking readers to mark out “sites of relevance” and mail them back to AREA. This idea stemmed from the success of the early “Mapping Chicago” brunch and was initially intended as a way to continue that process of collecting ideas and suggestions for future content for the publication. The response however, pointed us in new directions. An email arrived one afternoon from a local high school art teacher, Didi Grimm, who said she would love to get more blank maps from the second issue of the publication to use in her classroom as an assignment. We obliged her, not knowing where the exchange would lead, but wanting to remain open to new collaborations with this still young project. The result was tremendous, with Didi collecting dozens of maps from her students – many of which reflected their challenging relationship with local geography related to gang boundaries and others reflecting very personal perspectives on small micro neighborhood territories which make up the daily turf for most teenagers. She asked for more copies to continue the work and we shared with her a smaller PDF version, which could be emailed, printed out and photocopied without any special equipment. This exchange prompted some rethinking of the scope of this project. Maybe the blank maps could be an initiative in-and-of-themselves? Maybe there was more potential in distributing and collecting people’s hand-drawn versions of their city’s territory than simply getting ideas for what articles to seek out for future publications? Notes for a People’s Atlas of Chicago was born. It drew from earlier experiences with the mapping event, the first issues of the publication, and the interaction with the high school art class. It also drew from other references such as participatory action research, asset mapping, and art practices ranging from the surrealist drawing games to situationist walking tours to mapping projects by groups like Futurefarmers and Center for Urban Pedagogy. From that point on, the blank maps were photocopied in mass and were dropped off at the same places where the printed publication was distributed. Quickly the idea caught people’s attention and started to be included in local exhibitions at places like Polvo and the A&D Gallery of Columbia College. Every time AREA was invited to display the maps we had collected, there was always a stack of blank maps given away and a place for mapmakers to return their finished maps. The project started to have a very active feedback loop and our archive of Chicagoans maps of Chicago was filling up. At the same time AREA was taking ideas generated in the maps we received to generate more ambitious map-making concepts in the centerfold of the main publication. For each thematic publication we released a new map of Chicago or our greater region was distributed in mass to our readers – reinforcing the idea that AREA was not only a place to find out about Chicago-centric art, research, education, and activism – but also a place to produce and disseminate it. Soon interns were signing up solely to work on the People’s Atlas project and were further extending the collection process to public spaces downtown, music festivals and bars. The Wicker Park neighborhood arts organization Around the Coyote approached AREA about doing a neighborhood-wide collection project and several thousand blank maps were mailed out to residents of that neighborhood with their support. The basic concept of Notes for a People’s Atlas started to find interest amongst similar organizations in other cities. The first was BLOK in Zagreb, Croatia who invited two of us from AREA for a two-week trans-Atlantic visit to their Urban Festival to attempt to adapt the project into Notes for a People’s Atlas of Zagreb. Doing the project in another country was a great adventure but proved to be difficult because of limited time and the absence of a common language or personal networks in Croatia (all common challenges anytime a well-meaning artist or activist attempts to do their project in a context that is foreign to them without investing sufficient time, resources or preparation). The project resulted in a publication that combined some of the maps we collected over two weeks with some interviews with local urban planners and activists addressing land-use conflicts and how the legacy of Socialist urban planning affects current privatization plans. Soon after more invitations began to roll in to develop the project elsewhere. Lize Mogel and Lex Baghat who edited and curated the An Atlas of Radical Cartography project asked for People’s Atlas to be included in their Syracuse exhibit. The host venue, non-profit arts organization The Redhouse, took the project on as their own and got the local newspaper to print the map in its Sunday entertainment section. The response was incredible and they collected several hundred maps within a week. The staff of Redhouse continued to collect Notes for a People’s Atlas of Syracuse for months after the exhibition was over. This experience pointed to something that should have been obvious – that in order for this project to be adapted to other contexts it would require a host organization to take ownership and steward the process. This was why the first incarnation worked in Chicago, because of its association with AREA Chicago, which had developed the network and community support to get the blank maps into people’s hands across the city (and often to get them back to share with others). 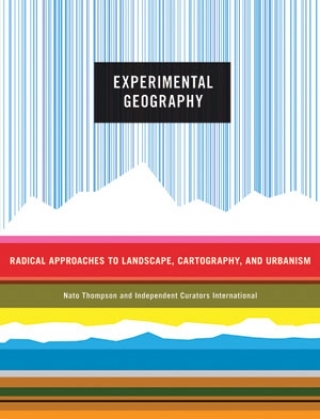 In 2008 the Chicago-educated curator from New York City, Nato Thompson, asked AREA to contribute People’s Atlas of Chicago to his touring exhibition Experimental Geography. We proposed instead to adapt the project to all of the cities that the show’s tour-management Independent Curators International were booking. While this idea was more complex, it fit within the outreach and educational mission of most of the host venues and allowed for a local and participatory element to be added to the otherwise static exhibit of maps and geography-inspired art objects. With the Experimental Geography project in line, People’s Atlas was expanded to 10 other cities over a three-year period. In each of these situations, AREA representatives would communicate with the host venue to find an agreeable map that would be traced and serve as the basis for their People’s Atlas map. The graphic would be photocopied and distributed in whatever way the host venue deemed most relevant and practical. In some cases classes at local schools would be assigned to make and collect maps, in others the map would be mailed out to local community groups and in others it was simply the exhibition’s viewing public that was encouraged to make their own map. After 15 cities had been completed it became apparent that the project could stand to be documented as a whole. A few more adaptations trickled in from the far off lands of Santiago Chile and throughout Ukraine. Oberliht, a public arts organization in Chisinau, Moldova, invited AREA organizers to that city. This time the project was led by the local group and AREA folks served as workshop leaders and advisors but not map collectors. The project was morphed into “Notes for a People’s Atlas of Public Space in Chisinau” as a way to focus the inquiry on a specific subject that felt particularly challenging and urgent to the hosts from Oberliht. While the project has continued to spawn like-minded efforts elsewhere, this publication brings AREA’s experimental Notes for a People’s Atlas to a formal close, although as AREA continues to hear of similar projects and receive maps, the People’s Atlas will live on as a web-gallery of images here at peoplesatlas.com.